On a night in which the No. 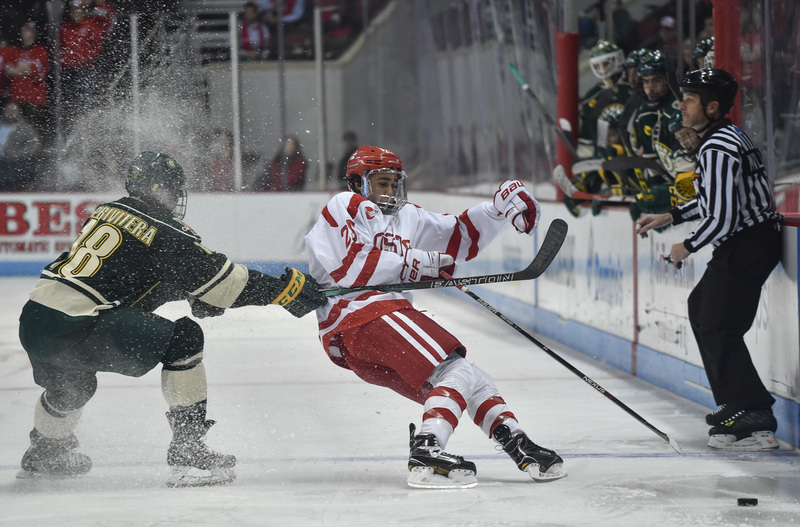 11 Boston University men’s hockey team played with a “complete lack of emotion,” in the words of BU head coach David Quinn, several players with former ties to BU proved effective for the University of Vermont. Forward Liam Coughlin, a South Boston native and former recruit of BU (7-5-3, 3-3-2 Hockey East), assisted on the eventual game-winner in a 4-2 victory for the Catamounts (4-9-2, 3-4-2 Hockey East) on Friday at Agganis Arena. He later notched an empty-net goal with a second remaining in regulation. Coughlin initially committed to BU in April 2014, but later announced he had instead committed to Vermont in October of that year. His empty-netter on Friday counted for his first goal of the season. Former BU recruit, defenseman Ori Abramson, had an assist on Coughlin’s empty-netter. Abramson decommitted from the BU program in August 2014 after first committing in January 2014. But perhaps the biggest influence came from a former BU player — and his brother. Defenseman Alexx Privitera, who played two seasons with the Terriers from 2011-13, also had a large impact in his first game back at Agganis Arena since he departed BU. In his two years at BU, Privitera had a total of six goals and 20 assists. He also had a profusion of penalties, accumulating 110 penalty minutes over the course of his BU tenure. Privitera’s departure came after he was suspended by then-BU head coach Jack Parker for the final 13 games of the 2012-13 season for on-ice discipline issues. Since arriving at Vermont, however, Privitera has flourished, recording just 20 penalty minutes in 41 games for the Catamounts in 2014-15. He also ranked fourth in the conference with 78 blocked shots. He entered Friday’s game ranked second on the team in scoring and he added a pair of assists in the matchup, including a secondary assist on the game-winning goal. His brother, Jarrid, a forward and also a former BU recruit who decommitted when Alexx parted ways with BU, had a goal in the first period on Friday. “I know this was a nice win for them,” Sneddon said. “I think they have a lot of friends here, whether it’s the guys in the rink or the staff. There’s still a lot of good feelings about their, or at least for Alexx, his experience here.